Is a side effect of capitalism inhibition? If you remember Max Weber’s The Protestant Ethic and the Spirit of Capitalism, the habits of blooming capitalists include a certain frugality, which by definition would imply an avoidance of immediate gratification. It doesn't take much of a leap to conclude that wealth goes hand in hand with repression. If you learned your lessons well (and hence manifest as one of the saved who’s been given God’s grace) you were going to be a person who was wary of the pitfalls of pleasure. Put another way hedonism is a little like using up the gas in your tank with sexual libertinism and promiscuousness finding their monetary equivalent in borrowing. What indeed would Weber’s proto capitalists have thought of today’s huge deficit economies that are constantly financed with more borrowing? Of course, socialist economies have no monopoly on pleasure; the dictatorship of the proletariat has yet to produce its Xanadu. Conversely, there have been numerous capitalists whose appetites would hardly have made them exemplars of the Christian values. But sensibilities leave their residues. 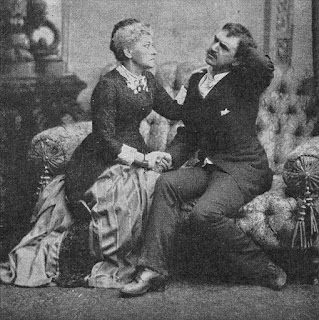 The repressive society Ibsen describes in a play like Ghosts can be seen as a product of the manners and mores Weber was writing about in his classic tome. The price of “success” in this dark Nordic world is disease--on both a physical and spiritual level. Can You Escape the Past?